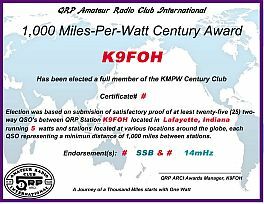 QRP ARCI provides a number of awards, each of which encourages low power enthusiasts to accomplish a wide variety of goals. We invite you to review the various awards and to make a commitment toward earning your own special award. A number of applicants apply for several different awards at the same time, which is fine. We hope you will review your log and determine if you might be eligible for any awards at this time. Please note that awards are free of charge for active members (maximum of 5 awards per year) - another significant benefit of active membership. 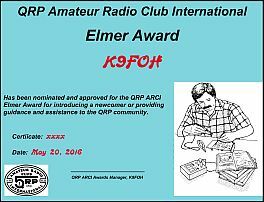 The QRP Amateur Radio Club International 'Elmer Award' may be submitted by any QRPARCI member for someone who has helped them along their amateur radio journey. Traditionally Elmers were probably defined as someone, usually an older ham, who provided a helping hand and guidance for someone, usually younger, entering the ham radio community. In today's fast paced, ever changing world of technology, communication advances, and the advancing age of many hams the Elmer can be viewed from a different perspective. Being licensed for many years, often decades, the tables can get reversed and it becomes the new, often much younger, ham who is performing the role of the Elmer by helping the more senior ham with guidance in new modes of communications and teaching some of the new technologies. The more senior ham may need help with antenna work or other station needs and the ham who once was considered an Elmer now is in need of the services they once provided. By broadening the scope and definition more deserving hams may be acknowledged with an 'Elmer Award' by a member who has benefited from their help and guidance. 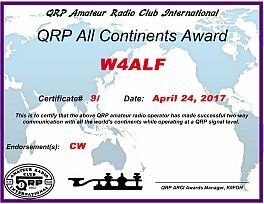 This award is issued for successful communications with 25 ARRL countries while running QRP. Endorsements are available in increments of 25 countries. All submitted totals will be listed on the certificate. A list sorted by ARRL Country Name and a GCR form is required. Band and Mode endorsements are available. 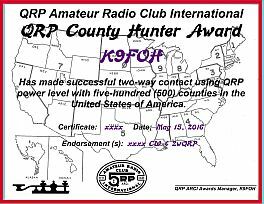 The County Hunter Award may be earned by successful two-way contacts with at least five-hundred (500) Untied States counties. Endorsements made be earned for additional counties worked in increments of 500, mode, band, or other factor. 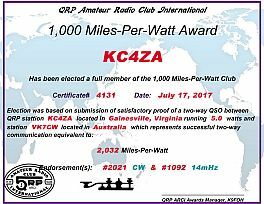 As with other QRP ARCI awards QSO confirmation is not required. Submit request using the QRP ARCI Consolidated Certification Form. Awards are free for current members (limited to five per year), others should submit $10 to the QRP ARCI Treasurer. Payment goes to the treasurer not the Award Manager. Multiple awards request may be submitted on a single form. 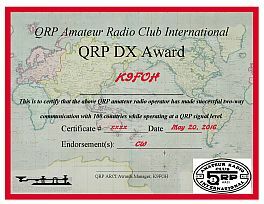 This award is issued for successful communications with stations in all six continents while running QRP. The continents are - North America, South America, Oceania, Europe, Asia and Africa. Australia is a country, part of Oceania, not a continent. Antarctica is part of Oceania. 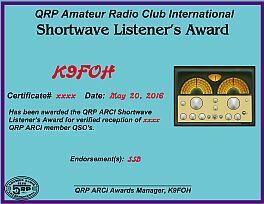 The Worked All ARCI Award may be achieved by on-air QSO's with at least twenty-five (25) other ARCI members. Membership does not have to be current for either station. 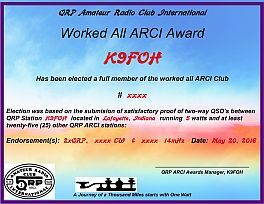 Your ARCI member number is good for life and should be exchanged during the QSO. 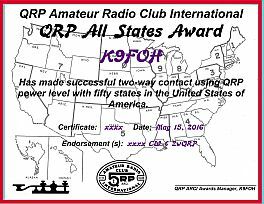 As with all QRP ARCI awards verification is done on the honor system and QSL cards are not required. Endorsements may be added for mode, band, or other factor. Submit using the consolidated Certification Form for QRP ARCI Awards form to the Awards Manager. Awards are free for current members (limited to five per year), others should submit $10 to the QRP ARCI Treasurer. Payment goes to the club Treasurer not the Award Manager. Multiple awards may be requested on a single application form. 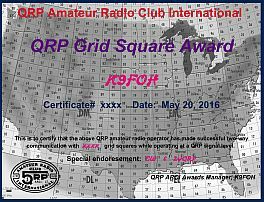 Issued for successful communications with 100 different grid squares, worldwide. Simple grid squares are used, such as EN73. Endorsements are available in increments of 25 grid squares. Band and Mode endorsements are available.